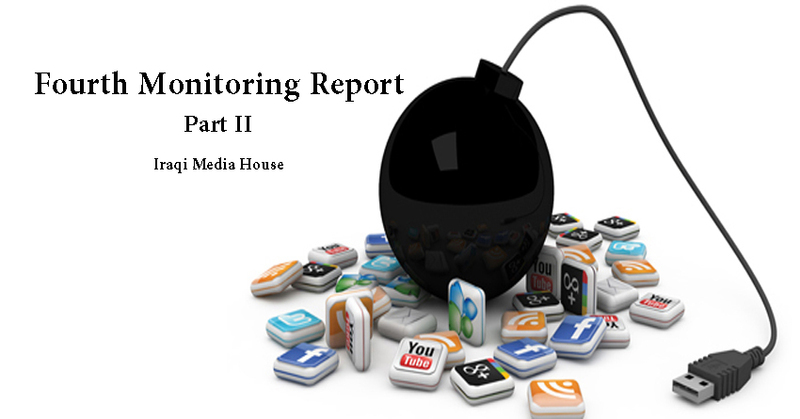 Over second part of the fourth monitoring report, Iraqi Media House [IMH] is trying to display an initial perceptions about media machinary of what is known as ISIS organize, or 'Islamic State', through a rough count on its various platforms and interfaces; Also inspecting its contents, and machinery of their display and promotion; As well as what ruses used by extremist organizations to evade blocking and closure procedures applied by the World Wide Web companies. Monitoring includes a preview of media language used in those platforms, methods of design, what is related to presenting ways, as well as their contents; also pursuing the visual materials display outlets, as the fundamental pillars in ISIS organize media products. So this part is dedicated to Social Media [social networking websites] and the style of using it for disseminating news. There is a close and growing relation between terrorism or all forms of violence, and general social media. Different studies within the last decade proved that both phenomena are excessively compatible. terrorist organizations rely idea of violence for accessing their objectives in changing social or political system, and they classify 'the propaganda' as one of the most important terrorism strategies in terms of spreading terror by publishing pictures of executions applied on its victims in exciting ways. Those violent groups took the social media as a basic trump, where these websites are considered fertile ground to spread their ideas and carry their concepts through communications and public relations to farthest point in the world. Internet has become the most flexible tool for terrorist groups, who sound spend lots of money in this field and turned the social Media to a most traded game for those who are fetishist of violence stories, as a result, activists and bloggers are generated, who promote violence daily and relentlessly. Popular social networking websites are a way to attract people from all over the world, especially youths, who sympathised by revenge stories and perhaps encouraged to join in solidarity with conviction issues, like defense of the underdogs or oppressed. The recruitment dynamic includes a list of targeted victims to be organized (tended to the organize, or just sympathetic), by following up their accounts on Facebook or Twitter by strangers and virtual friendships, in order to collect accurate and enough information about them (their pictures, social status, orientation, psychological state) through their posts for example; then after recruitment strategy is applied according to the principle (each category according to what suits the characteristics). Al-Qaeda organize for example, use the Internet to publish articles 'anonymously', while ISIS has followed 'direct method', especially when uploading videos of attacking cities, or executions. .
First: Records of Social media monitoring process for 2014 shows that Isis had succeeded in creating interaction with 700,000 accounts discussing terrorist groups issues. Second: Coinciding with Mosul Attack [Northern Iraq], ISIS publishing activity has increased reaching almost 40,000 tweets in one day, launched from Mosul streets. Twitter has tried to repulse ISIS, by suspending around 1,000 accounts suspected of terrorist groups links. Videos and photos are loaded daily by fighters, and shared globally, both by ordinary users or news organizations. It is not easy to comprise all ISIS supporters' publications over social media websites as they are estimated according to some sources 90 thousand publication per one day, so we picked samples of highlighted events which grabbed a wide attention by media during February 2015, to understand mechanisms of ISIS propaganda, as a logical prelude to recruit fighters and catch sympathizers to join the project on the ground or virtual world. ISIS supporters publish a group of tweets that analyse and justify the organize brutal behaviour, based on religious and jurisprudence provisions, Customary measurements, as well as Historical precedents in terms of Reciprocity with the enemy whether they are armed or civilians, attacking or defending, and confirm with assertiveness on that slaughter and burning are parts of the mechanisms deter the enemies, horrify them, and ease of their defeat and submission. ISIS organize and its supporters do not find scenes of slaughter abusive or cause of suspicion, but they consider them proudest and effective means to achieve the desired effect. Addressing concepts and values have a deep and sensitive impact among local community, Muslims in particular, related to ‘Muslim women and honour violation’. ISIS supporters have Tweeted coordinated posts regarding five women who diverted to Islam from Coptic origin were abducted years ago by Coptic Church, and have been hidden been abbess in cooperation with the Egyptian regime; and after applying Copts' slaughter, most of the tweets linked that incident with the five women’s kidnap including a woman named Camellia; most of the tweets bode Camellia and her companions that ISIS avenged for them. Another tweets taken over farthest and based on historical related to war between Muslims and Copts and indicated that latter group fought Muslims for eras of time. Another example of reciprocity, slaughtering Copts in return to killing bin laden and throwing his body in the sea. spreading the culture of absolute violence and considering brutality as an integral part of the Islamic heritage by invoking doctrinal provisions of historical incidents of the era of the Islamic conquests, as in a tweet refers to an historical battle called 'River of blood', taken as an example for battles of this period of time. A direction opposes to the line taken by 'Ayman al-Zawahiri' and the 'Muslims Ikhwan', so tweets were spreaded in advance condemn expected reactions by 'Qaeda' followers and supporters of 'ikhwan' which described their attitudes as Complacency tolerance according political interests. ISIS organize depends on social media in refuting clergy statements who do not agree with its approach and do not acknowledge its practices, and is often this is done by retrieving old advisory opinions of clergies and compare them with new ones in order to indicate the contradiction as a result of governmental authorities' impact on their attitudes. ISIS supporters in social media exploit the widely spreaded tweets in publishing new and visual reports about the organize operations and activities over the areas seized by ISIS, like repairing bridges and roads, in addition to the establishing Islamic courts, police stations and reopening in schools, colleges and universities after the amendments applied to curriculums that correspond with organize ideology. Attack that happened recently in 'al-Baghdadi' township in 'Anbar' could be taken as a standard model for how they way ISIS uses social media in order to promote for its state project and give it credibility in quick and accurate transfer the information compared to the floundering and slow government statements. momentum and higher coordination in spreading fast and specific information supported by pictures or videos directly from scene, intense and perseverance of supporters and followers on applying updates that backed by web links related to Arab satellite channels, US newspapers, news clips affiliate to international T.V. Networks. Publishing governmental statements and refuting and ridiculing them through indicating the conflicts in information they contain. Detecting attack plan and how to be implemented, accompanied with expectations for greater achievements by appealing supporters and followers for prayers for achieving occupation of strategic base. Deploying a high quality visual release of last week military operations and promising the audience with soon issuance of 'al-Baghdadi' township attack; multiple accounts observed for some users, linked with each other to raise their evaluation and strength against reports, mutual support between users, constant retweet and share campaigns between users to benefit each other, sharing experiences on avoiding ban, for example periodic change of name, also introducing latest delivery and photography equipment. Anti-ISIS accounts on that period and from within the previously mentioned hashtags pool, were only four, with an average of 19،984, Including two accounts belong to media organizations, one is a religious satellite channels , while absence of Iraqi news websites from the scene in Twitter was noted, their activities were confined on repeating official statements coupled with old photographs on repelling militant attack of ISIS on 'Ein Al Assad' base, as well as the counter attack of Iraqi army joined with tribal expel militants out of Al Baghdadi township centre, also underestimating the danger of ISIS attack, plus resulted losses in ranks of armed forces and supportive groups. 42 supportive pages for ISIS was monitored, with 306.672 likers as an average. Ramp up and quick publishing brief, specified, abd unified news about ISIS attacks. Active updates on information, supported by photos and videos . Publishing materials selected from European and American newspapers and channels websites and analysis of military experts on organize attacks and their impact on event area and its strategic reflections of war conduct on the organize. Publishing governmental statements and ridiculing of them for not being associated with photo evidence from the battle ground. Most pages and accounts are backups for banned originals created since few days or hours, and they are normally closed before their followers’ number up to few thousands. Syrian and Egyptian page which sympathetic to ISIS are mostly contribute in publicity, also pages of some Arab Gulf figures take role in this field. Widespread personal accounts mostly lock friend request and and messaging options, and allow only follow-up, their publications usually are the fastest, most accurate and credible. Sympathetic pages take names which gives expression oppose to ISIS, and use misleading hashtags, which allows them to appear for hostile publics. two pages [one for media, one belongs to a tv channel], and one account with an average of '122 700' followers are all that shown by monitoring search of same hashtags 'Ain-Al Asad' and 'Al Baghdadi' township; they all specify their publication only in confirming the repel of attack and the elimination of dozens of militants, with lack of news updates and Unspecified location photos, the large number of their followers due to several years of establishment and not being exposed to risk of ban. Some of Iraqi news pages use hashtags which are limited to Iraqi government statements and spokesman for the US Department of Defense. At a time that ISIS is characterized by high ability to change military methods to comply with the nature of the geographic and demographic field, it also diversifies the ways and methods to mobilize supporters and gain sympathy through speech that touches local crises of population region, where it aims to spread, as it present itself in a mythical image attracts young dreamer and enthusiast In Iraq. Example: a tweet says 'Iran is our enemy, Suleimani leads Tikrit battle with 10000 militia members'. Nationalistic dimension, as supporters of the ISIS highlight the effects of military operations carried out by ‘Peshmerga’ forces describing them as 'Godless', as well as the International coalition forces bombardment, by publishing photos of victims and damaged materials in houses and civil institutions; the associate all this with the conspiracy theory by for extermination Sunnis in Iraq. Human dimension, in which focuses on human cost of military operations directed against its armed forces on civilians. Strategic dimension, ISIS supporters often connect between course of events in Iraq and the emergence and expansion of the Iranian role, with fate of the rest of Arab countries which experiencing civil wars and armed attacks; they even put those stable countries with the same hashtag within the same tweet, as well as use of historical metaphors related with profound implications, such as the term ‘Third Qadisiyah’ Persian Safavid and hatred against Arabs and Sunnis. Legendary dimension, the organize represents its fighters in social networking websites in form of superheroes who achieve great wins and championships despite their limited numbers compared to numbers of enemies, there stories published by the supporters as coordinated tweets attached with photos and links of videos or blogs that contain their photo galleries; Also the organize concentrate on documenting its suicide missions and photographing its bombers while they direct their last message before carrying out attacks, and how they look calm and tranquil, in addition to sound effects and that Gives intimation of spiritual scene . Some of them was suspended then re-emerged, so the list is not stable at fixed rates.